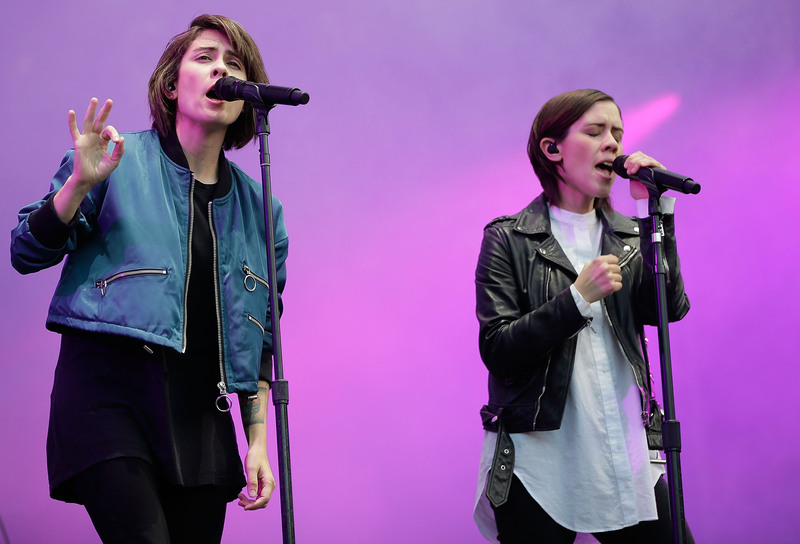 The Canadian indie-pop duo known as Tegan and Sara have long been staples on the playlists of lesbians, bisexual, and queer women around the world. Across nine albums released over the past 18 years, it's basically impossible not to find at least one track that resonates. But as 2016 comes to a close, everyone's favorite identical twin lesbian sisters are putting their money where their mouths (and hearts) are. On Dec. 19, the same day the Electoral College officially elected Donald Trump as the next president, Tegan and Sara Quin launched a charitable foundation aimed at supporting LGBTQ women and girls around the world. Simply called the Tegan and Sara Foundation, the new nonprofit's goal is to "fight for economic justice, health, and representation for LGBTQ girls and women," according to the foundation's website. In addition to making the announcement in a tweet (see below), the sisters Quin wrote a letter explaining why they're choosing this moment, and these issues, to take a stand. "Our journey navigating sexism and homophobia in the music industry has always been interwoven with the stories you share with us," Tegan and Sara wrote, thanking their loyal LGBTQ fans. "Your personal histories of injustice and discrimination at home, school, work, and church have inspired us to use our public status to speak out about the struggles of the LGBTQ community." The sisters explained that they spent much of the year touring North America for their latest album, Love You to Death, performing nightly. But that wasn't the only memorable part of their year. They also made a concerted effort to listen to and learn from the members of the broader community about ways LGBTQ women often get left behind in the broader conversation about "gay rights." "LGBTQ women are experiencing disproportionately high levels of poverty, health issues and inequality," Tegan and Sara wrote. "LGBTQ women of color, especially transgender women often experience these issues even more severely due to racism and transphobia. Today, given the state of politics in the United States, we must continue to unite and fight for our rights and against all forms of oppression." As a queer woman and a journalist who has spent her career writing about LGBTQ equality, I can confirm the accuracy of this assessment. If anything, I would have added some data to really drive the point home — like the fact that at least 26 trans people have been murdered in the United States this year alone. Most of these victims have been trans women of color, particularly black trans women. That's more documented deaths than any other year in American history, and it doesn't include deaths which went unreported, or those who were misgendered by police and media. The Quins conclude by explaining that their fledgling foundation will support existing efforts to defend the rights of LGBTQ women and girls, promising to be proactive, "rather that wait[ing] to react to discrimination as it occurs." They name-check the incoming Trump administration, vowing to "fight against the repressive legislation" that could be introduced under the president-elect himself and Vice President-elect Mike Pence. "We started the Foundation to dismantle the systems of inequity that prevent LGBTQ girls and women from reaching their full potential," the sisters wrote. "Together, we can make a difference." If that sounds suspiciously like a certain historic presidential candidate's campaign slogan, it should. As Canadians, the sisters weren't eligible to vote in the 2016 election, but they have long supported the work of other fierce women — including using their time on-stage during election season to let fans know #ImWithHer. So for everyone who felt the gut punch of misogyny on election night, when Pence had the audacity to proclaim that Trump's victory was what made the day historic, take solace in knowing that we've got some smart, politically savvy songstresses on our side. And for my fellow LGBTQ women, take heart, and know that you are seen, that you are loved, and that you matter. We need you, Tegan and Sara need you, and this country absolutely needs the light you emanate to survive the coming darkness.